A Belize sailing itinerary eases you into a world of natural wonders amid a series of marine preserves tucked behind the protective barrier reefs off the Belizean coast. The islands and cays are mostly uninhabited, fringed with swaying palms or lined with lush stands of mangroves. White-sand beaches front secluded anchorages with kaleidoscopic colors of brown, orange, green, and blue over the reefs. Balmy trade winds blow steadily and sure, promising exquisite sailing as you explore the less traveled cruising grounds behind Belize's barrier reef system. It's one of the best in the world for swimming, snorkeling, scuba diving, windsurfing, kayaking, or just relaxing aboard while you admire the setting sun. Laru Beya Marina to Wippari Cay - 14 nm. As you leave the marina, you motor into the heart of the exquisitely beautiful Placencia Lagoon, an almost landlocked finger of water running along the Belizean coast. Once you're clear of the lagoon, you set sail and head northeast to Wippari Cay, where you can pick up a mooring for the night and relax in the cockpit and sip a refreshing cocktail before dinner. Stopping at Wippari Cay will put you in a good position for the sail to South Water Cay the next morning. Wippari Cay offers good snorkeling to the northeast and northwest, and great fishing as well. Wippari Cay is located 4 miles northeast of Lark Cay. Just a five minute boat ride away is some of the best fishing you'll find anywhere with tarpon, bonefish, snapper, grouper, and more. Whipray Caye Lodge's open air Sea Urchin Bar and Restaurant serves up a variety of Belizean and American food, mostly fresh catches, and the fully stocked bar serves the coldest beer for miles around. Cruising in Wippari Cay waters is a delightful part of any cruise in Belize. Mooring: A few moorings are available. Things to do: The fishing is world-class in these waters. Taking some time to try your hand at landing the catch of the day is a pleasant addition to the sheer pleasure of yachting in Belizean waters. Wippari Cay to South Water Cay - 22 nm. Heading north-northeast takes you up the Inner Channel to the Blue Ground Range. Practice your shallow water navigation skills through the passage to South Water Cay, gently meandering between patch reefs. Although South Water Cay is part of the Belizean marine preserve, it's also inhabited. There are three restaurants and great snorkeling, especially at the northern end of the reef near Carrie Bow Cay. Mooring: There are usually 4 or 5 moorings available at South Water Cay. Anchoring is discouraged as the holding is very poor. Anchor on the west side of South Water Cay in the numerous sandy patches between tufts of sea grass. Protection is only good from the prevailing easterly winds. If the winds are predicted to shift or strengthen (even from the east), the better anchorage for overnight stays is at nearby Twin Cays. Dinghy dockage: Beach the dinghy virtually anywhere on the west shore or near the lodge docks. Things to do: Fishermen plying these waters named South Water Cay for the fresh water wells on the island. The two-story, red-roofed Pelicans Pouch, the main lodge of Pelican Beach Resorts on the south end of the cay, was a convent for the Sisters of Mercy when it was built in the 1940s. The Fangipani House (meaning gray house) is said to have a friendly ghost in residence. At the northern end of the island is the Blue Marlin Lodge, also part of Pelican Beach Resorts. It has a restaurant and bar. Dive excursions are also available. At the center of the island is an educational facility, International Zoological Expeditions, which has accommodations for students studying tropical biology and reef ecology; they also serve breakfast, lunch, and dinner for boaters (dinner reservations required). A path runs down the middle of the cay, making for a pleasant afternoon stroll. Facilities: Internet access, limited water, limited provisions (by arrangement), and laundry service are available. Scuba tank air fills are available at the Blue Marlin Lodge. South Water Cay to Cocoa Plum Cay - 11 nm. Sailing north just inside the barrier reef, favoring the reef side of the passage, brings you to beautiful Tobacco Cay, where you can drop anchor and enjoy some superlative snorkeling. Later, continue on to the north-northwest toward the southern tip of Garbutt Cay before turning south to the moorings at Cocoa Plum Cay's Thatch Cay Resort, an excellent stop in your Belize itinerary. There's a nice restaurant at the resort, as well as Internet access. Thatch Cay Resort is very popular, especially with children, because of the many coatamundi that roam freely around this cay. Mooring: Three moorings are located on the western side of the cay, and two moorings are located on the eastern side, affording protection in all seasons. There is no suitable anchoring site as holding is poor in thick seagrass. Dinghy dockage: A dinghy dock is available inside the seawall on the western side. Things to do: Take a relaxing stroll on the nature paths and observe wildlife ranging from rabbits, coatimundi, and Belizean raccoons, to exotic birds and sea iguanas. Enjoying dinner and drinks at the Thatch Caye Resort is a pleasant way to spend a late afternoon or early evening. Facilities: There is a small craft marina with a boardwalk for you to enjoy (no accessible to yachts). Water and provisions are available. There is Internet access in the resort's guest areas and WiFi is available at the anchorage. Scuba tank air fills are available at the resort. Fresh water is also available and can be delivered to your yacht or pumped over into your tanks. Cocoa Plum Cay to Lagoon Cay - 16 nm. The next leg of your Belize itinerary takes you on an easy broad reach down the Inner Channel, with the picturesque and remote Belizean coast stretching out before you across the brilliant turquoise waters. You then enter the Victoria Channel just south of Quamino Cay, and make a short tack to the northeast to reach your next overnight anchorage. Once at you are at anchor, your graceful yacht riding to the gentle, balmy breeze, relax with a refreshing cocktail in the cockpit, take a swim, or kayak along the cay. Lagoon Cay is also great for fishing and bird watching. Ospreys, frigate birds, pelicans, and cormorants roost on the trees of the inner lagoon. Mooring: There are a few moorings available. You can also anchor just outside the lagoon for fair protection in northerly winds. Things to do: Exploring the lagoon by kayak is delightful as you paddle quietly along the shores and view the abundant and very beautiful seabirds. A ring of shallow coral around the island offers good snorkeling possibilities. Lagoon Cay to Queen Cay (Silk Cay) - 17 nm. Sailing on a southeasterly heading down Victoria Channel, you soon round Little Water Cay and then proceed east to Queen Cay. The Queen Cays (locals call them the Silk Cays) offer unforgettable snorkeling and diving along the edge of the barrier reef. The best beach and anchorage is off the southern cay. There's a picnic table ashore nestled among the tall palms, where you can enjoy a leisurely lunch. Mooring: Moorings are off the southern end of the three cays. No anchoring is allowed at the other cays. Things to do: Enjoy the amazing snorkeling and take in the beauty of the surrounding reefs. Facilities: No facilities for yachts are available. BBQ facilities are available ashore on the southern cay; portable toilet facilities are also available on southern cay. Queen Cay to Ranguana Cay - 8 nm. Your Belize sailing itinerary takes you southwest across clear, open water to Ranguana Cay, an excellent overnight anchorage affording an opportunity to go ashore for dinner at a small resort. An interesting detour to Laughing Bird Cay National Park for a day of bird watching and snorkeling will add another four nautical miles to the passage, but it's an easy off-the-wind sail and well worth the endeavor. Named for the laughing gulls that nest there, the cay has one mooring. Both Laughing Bird Cay and Ranguana Cay are incredibly beautiful examples of Belizean sailing. Mooring: Three moorings are available. The best anchorage is just west of the sand spit at the southeast end of the cay. Dinghy dockage: No dinghy dockage is available. Beach the dinghy anywhere on the west side of the cay. Things to do: Snorkeling on the patch reefs near the anchorage is interesting and pleasant. Check out the Ranguana Reef Resort's small restaurant and bar. Fishing is great, as is diving. Facilities: No facilities for yachts are available. Scuba tank exchanges are available by arrangement with Roberts Grove Dive Shop. 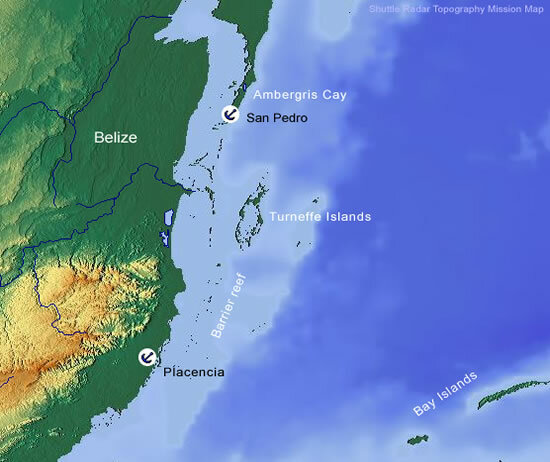 Ranguana Cay to No Name Point (or Placencia Harbour) - 18 nm. Situated just 8 nautical miles from Placencia Harbour, No Name Point is a well-protected anchorage and a good jump off point for a Monkey River Tour. Alternatively, Placencia Harbour makes a great stop on the last night of your Belize sailing itinerary. Going ashore to explore the village is delightful. There are many restaurants serving a variety of fare, including Creole, Italian, French, and Indian. Mooring: No moorings available. The anchorage west of Placencia Cay is excellent when winds are from the northwest to east. The bottom is turtle grass. Make sure your anchor is well set. Things to do: Dining out at one of Placencia's many restaurants is a delightful way to spend an early evening. There are also a number of bars. The market in town is a great place to browse, and you can buy all kinds of local products. Facilities: Dockage, water, ice, and provisions are available . No Name Point (or Placencia Harbour to Laru Beya Marina - 10 nm. Although you won't want to sail back to reality (you can always come visit Placencia again! ), the final leg of your charter is an easy sail north back to the base. Please check in by noon. Lying 60 miles southeast of Belize City in Lighthouse Reef, the Great Blue Hole is one of the world's most unique geological phenomena. The snorkeling and diving are superb, and well worth a visit. 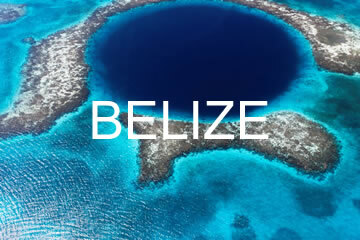 A guided excursion with hired skipper is required by Belize law when visiting the reef.